Heathcote Williams. Sweet dreams Heroic Prince. Amongst uncountable powerful magical acts of creation, Heathcote and Mike Lesser brought International Times back to life – Heathcote providing most of the good people, and tireless encouragement to all. He was a great man, great Anarchist, poet, playwright and all round approachable and sympathetic leader. It’s difficult to remember a time since the early nineteen seventies when he wasn’t at the very least an interesting part of me and my comrades’ lives. A man of immense heart, sympathy, intelligence and wit, missed so very very much. With deep love and sadness. Dream for us in the great beyond and we will listen to you Heathcote. This entry was posted on 2 July, 2017 in homepage and tagged RIP Heathcote Williams. Bookmark the permalink. The most generous mentor a fledgling could possibly hope to have. An awesome intelligence and such a deeply compassionate nature…The single sunbeam who drove away many shadows. Bless you, and thank you, Heathcote. Take comfort all ye who mourn. For Heathcote’s body will disappear – a term of magic – but his spirit flame, through his work, will burn all the brighter for all the people of now; and for all the unimaginable future to come. Adios compadre of all. Somehow this poem, translated by one of my dad’s friends, came to my mind when Mike died and again with Heath. Thanks Lin. How are you? Long time…….. I am very well, living in Brittany as of this past July. But suffering too many people leaving, Hoppy, Mike, Heathcote and, of course, my parents. Lin I’ve added this poem to next weeks issue from you and us for Heathcote. Hope is okay. This is a response from the Argentine novelist, teacher and critic, Jorge Torres Zavaleta. [‘…Yo tenía un gran aprecio por él, su personalidad y su poesía. Era una gran personalidad; justamente, un excéntrico que era un fiel representante de un anarquismo individualista humanista de gran tradición en la cultura inglesa. Era el hombre que está solo y que sin embargo se conecta con los valores más civilizados y racionales, aún cuando pareciera demoledor e irracional. [‘…I had a great admiration and appreciation for him, his character and his poetry. He was a big personality. Truly, he was an eccentric, a shining example of the kind of individual anarchic humanism, which is a great tradition in English culture. He was unique, a one-off, the man who walks entirely alone; and yet is fully connected to the most civilised and rational values – even when it appears that he is acting like an irrational demolisher of them. My appreciation for him has never stopped growing….’]. ‘Poets are the unacknowledged legislators of the world.’ Thank you, Heathcote. 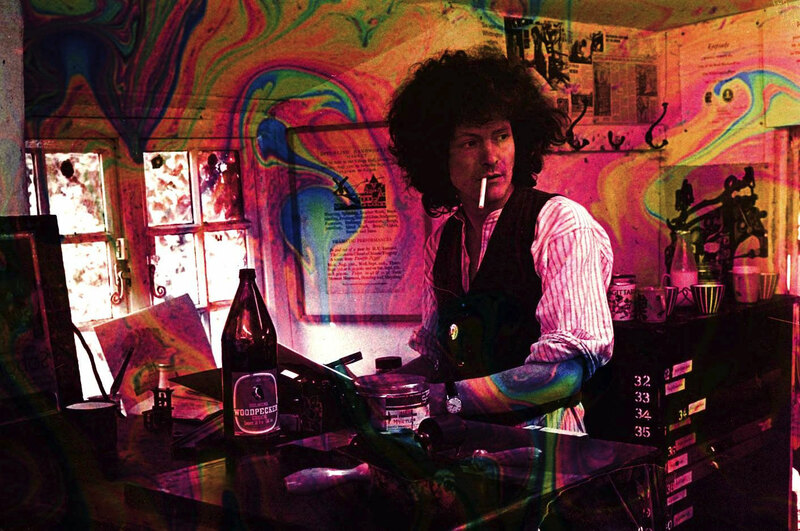 Sad to read about the death of Heathcote Williams, a person who spurred my youthful years into hard thinking and creative moments. He was a great friend to me. We met in London in 72, and remained comrades thru the decades that followed. A wit, mime, muse to many– if Willie Blake was God’s Rake- Heathcote was his modern equivalent. I did a version of his Local Stigmatic in Chicago, directed by Gary Houston and co-player was Jim Jacobs- whose Grease is still playing worldwide. My love to Diana , China and Lily, and we will not see his like again. He was much loved. I only just got this news. I’m shocked, of course. Heathcote was a great comrade in activism and writing. A real ‘human being’. I admired his grounded radicalism and learned much about the Queen. May his spirit soar – and may we pick-up on his tireless destruction of all that has no place on this Earth.